I guess I don't have to introduce you to Festo, the famous feast in the kingdom of Gloutama. What? You don't know that feast? And you neither know the famous kingdom? But haven't you seen all that colourful halflings, running from one market to the next to search for the freshest food? 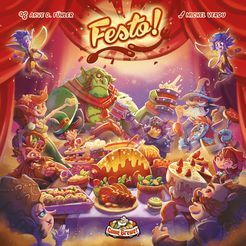 Celebrating the beginning of autumn, that's what we are doing, because it's the eve of Festo, which is also the name of the game I am writing about. Well, not exactly... It is more the preparation for this big event than the feast itself. You must know that all the halflings in this world really love this feast, and want to outdo each other in preparing the heartiest and tastiest meals. Indeed, composing the meals for the Festo is a brisk competition among those small people. Now I give you three guesses what's our task in the game. No, we are not the restaurant reviewers who only have to eat the meal and make whimsical comments. And no, we are also no wizards coming across to display splendid fireworks. Of course, we take the role of the halfling cooks and have to prepare the meals. Dissappointed? There is no reason to be. Composing the meals is a reputable task as you will see. So, on their turns the players send loyal helpers to the different characters of the market. Each round has two phases to send the helpers, the morning and the afternoon. Thus you can see where other players are sending their helpers and adjust your choice in the next phase. Moreover the one or other shop has its closing time, so several shops can only be visited in one half of the day. Anyway, after all players have placed their helpers and the second sending phase is over, the majority of helpers is determined for every character of the market. One by one the characters are treated. And at each character, it is checked in which order the players perform their actions. Of course, the player with the most helpers at a character goes first. She or he can either choose to take as many from the available ingredients of this character (each character sells his own kind of ingredients) as the number of her or his helpers, or she or he can use the character's ability. Let me explain these abilities: first of all each character has its own ability. So for example at the magician you can take a salt, that works as a joker and can be used for any other ingredient when it comes to cooking. Or the dwarf posesses the special ability to place two special disc at any characters for the next round already. These discs can be used as helpers, additionally to your other helpers in the next round, so they might become quite useful indeed. After the first player has performed her or his action (either the collecting of ingredients or the special ability of the character), all other players can use the special ability of the character too. If, after that, there are still free helpers (that weren't used to collect ingredients or for activating the special ability of the character) and if there are still available ingredients, the players - in turn order - may take another ingredient from the character for each of their remaining helpers. In the cooking phase we simply take from the available dishes on the game board. Ah, wait! Of course you must have the matching ingredients for the dish, fish and chips cannot be prepared without a fish, right? 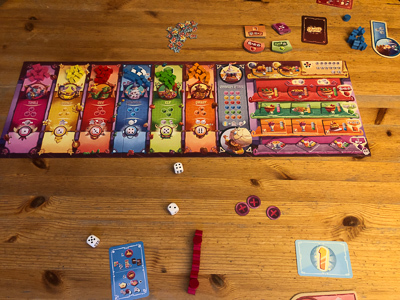 Players can take as many dishes as they like, but they always have to "pay" with the ingredients from their storeroom for the dish as indicated on the dish token. Desserts and drinks are easier to prepare than roasts and main courses. Consequently, they demand more ingredients from a player, but on the other hand they are worth more in the end, because the dishes are already our victory points. Festo! is played over four rounds and each round the ingredients at the market are refilled again and new dishes become available. Nevertheless there will often be shortages, and so it seems to be useful to plan ahead and keep some of the ingredients for the next round. After Kitchen Rush in the last year, Festo! 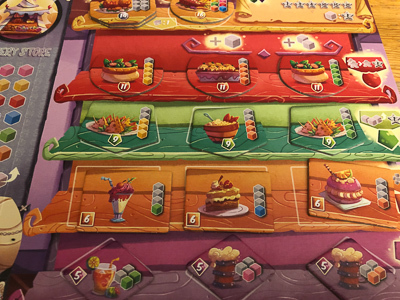 is the next cooking game in the huge boardgame market. 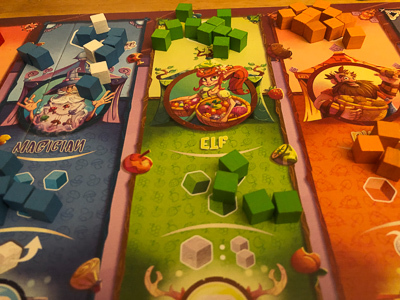 The game is very colourful, the rules are simple and the gameplay is fast. A light worker placement I could easily play with my 7 year old son, but also a game to begin to learn tactical planning. In my opinion Festo! is a nice, well designed family game, no more, no less. You must like the extravagant colours, but if you do, the game will be an eyecatcher for your guests. And for all of you who want more, you can spice the game by magical dishes. In this variant you flip the dishes after the preparation. As a result you get a benifit from that dish for the rest of the game. That slightly makes the game more strategic.